Not only do I not have any job alerts as the email would like to suggest, I also didn't switch the generic alerts to Daily, nor did I want it to be done for me. I don't tend to keep on top of Jobs, so I don't know if this is a new type of alert email or not. If it is: don't automatically subscribe me to things I didn't ask for. If it isn't, why has this happened? I've looked at the alert in question and it was created in April last year from an IP address used by your account. We've sent only 3 emails to you, 1 of which was today, the previous 2 (as you mention in comments) were sent in November. 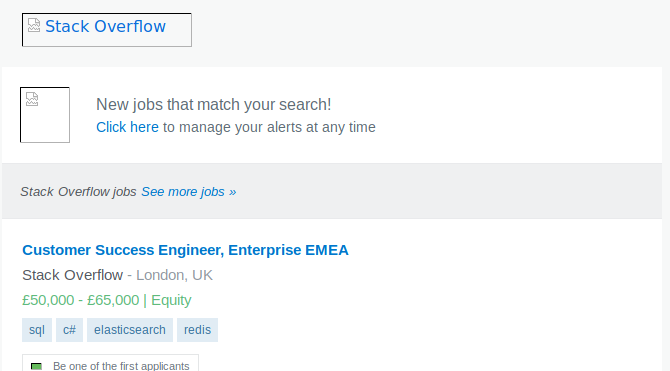 I can see from the traffic logs in April that you poked around /jobs a little and the alert was created after visiting a company page. You unsubscribed from that alert but then resubscribed to it later. Happy to go into more detail, but looks like this was an alert created some time ago that was only triggered when jobs matched the search terms specified within it.